A Pembrokeshire beach has beaten the likes of Royal Ascot and the Glyndebourne Festival Opera as the best spot in the UK for a picnic. 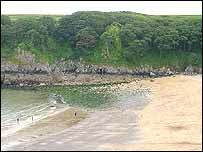 Barafundle, near Pembroke, is the perfect location for eating outdoors, according to Country Life magazine. Its writers considered the merits of spots such as London's Richmond Park, but plumped for the "glorious golden sandy beach" at Barafundle. They said it had "everything to make the summer special." The beach is no stranger to accolades, as in 2004 The Good Holiday Guide chose Barafundle as the best beach in Britain and in the same year it was named in the top 12 in the world. Despite this, and what makes it so special with those in the know, is that with the exception of the busy August holidays there are usually few people there. Tim Jones, a ranger with the Pembrokeshire Coast National Park Authority, said: "There are no ice cream vans, no shop, no car park and it would take a family the best part of 15 to 20 minutes to walk there but that just adds to the attraction. "There are steep steps up and down so it's fairly rugged but it's well within most peoples' capabilities - just not with a trolley or a wheelchair." He said he had been going there for as long as he could remember. "When I was seven years old I had my birthday party down there and remember carrying the cake and candles. "It's got very yellow sands, it's wonderfully clean and it's normally quiet. "There are sand dunes, the beach drops steeply into the sea, so it's good for swimming and when the tide is out there are caves to explore. "From the middle of the bay there is a full view of Caldey Island which just adds to the atmosphere." The beach is managed by the National Trust. Its property manager for Pembrokeshire, Jonathan Hughes, said he could understand why the magazine's writers had fallen for its charms. "We run an education centre here for children from the cities and one of the highlights of their week is a walk along the clifftop and then the descent down to the beach. "A lot of people say it has a feeling of being abroad - it's very Mediterranean. "One of the best times to visit is on a long June's summer night when there are not so many people about." "You're cut off from the pressures of the outside world"